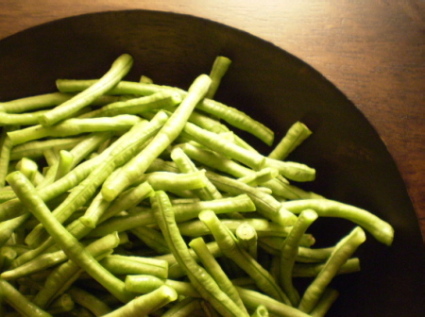 Delicious and versatile, Chinese long beans are a perfect spring stir fry ingredient. The rich flavors of soy and oyster sauces mingle with pungent ginger and salted black beans to make a rich, savory gravy. 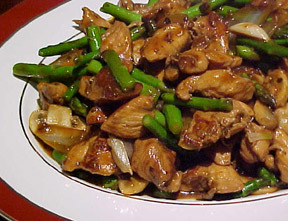 Tender, marinated chicken marries with the crisp beans for a textural treat. Season chicken with 1 tsp sesame oil, salt, white pepper, and 1 tsp light soy sauce. 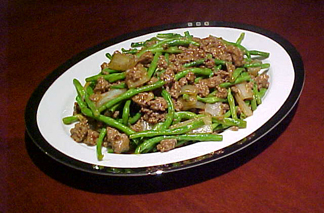 Stir and marinate for one hour in the refrigerator. Heat a wok over high heat. Add vegetable oil until slightly smoking. Add chicken and cook, browning well. Remove from wok. Add onion, garlic, ginger and mushrooms, stir frying for 30 seconds. Add black beans and long beans. Stir fry for one minute. Add remaining tsp light soy sauce, dark soy and oyster sauces. Stir to coat well and cook one minute. 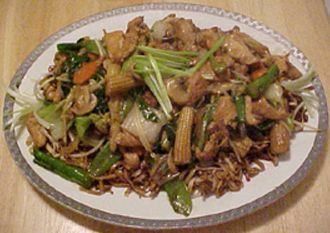 Add chicken back to wok and toss to combine. Add chicken stock and bring to a boil. Dissolve cornstarch in 2 tbl warm water. Add to boiling wok and stir until thickened. 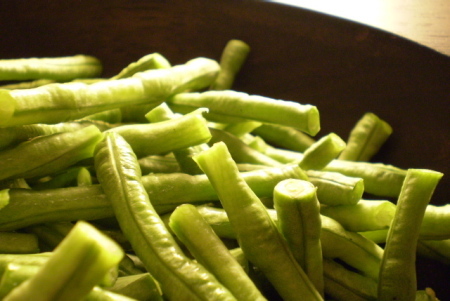 Check beans; they should be fork tender. Cover and cook until just done, but not overcooked. Check seasonings and drizzle with sesame oil. Serve immediately.